Keller Caubarreaux, an Attorney at Doehling Law, stopped by our studio to talk about ATV accidents. He covers how to stay safe while riding, how to make sure you're covered incase of an accident, and what to do if something were to happen. Keller Caubarreaux with Doehling Law stopped by the Fox 4 studio to talk about proving damages stemming from an accident. 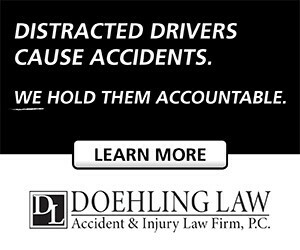 Keller Caubarreaux, an attorney at Doehling Law, stopped by the studio to discuss another important topic to understand if you're ever in an accident. Comparative negligence comes into play when both people involved in the accident are somewhat at fault. Ultimately, a jury or court would decide what percentage of the damages each party will pay. Keller Caubarreaux, an attorney at Doehling Law, stopped by the Fox 4 studio to discuss the importance of properly and promptly managing your claim after an accident. He recommends contacting your lawyer and insurance company about the claim in order to do a complete evaluation of the situation before moving forward. Keller Caubarreaux, an attorney at Doehling Law, stopped by the Fox 4 studio to discuss the most important thing to do if you're ever in an auto accident. He covers things like personal safety, exchanging information, witness testimony and insurance interactions.